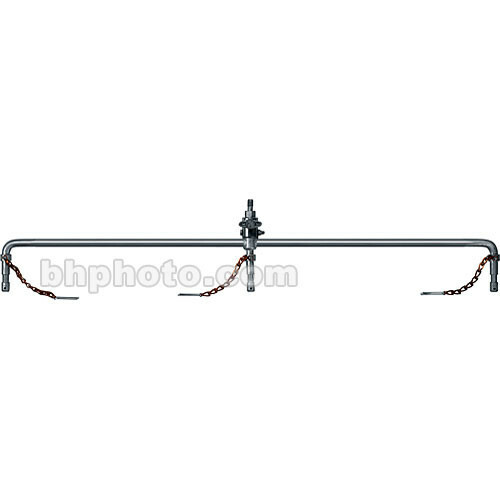 This is a Mole Richardson Triple Hanger with 1/2"-13 Thread - Accepts 3 Baby (5/8") Fixtures. Adjustable hangers (with the appropriate fixture adapter) enable lighting technicians to add fixtures that are offset from the established grid or pipe system. Once the angle of the heavy duty clamp and the extension amount is selected and set, a fixture can be used as a "special", or to create an added lighting effect to a scene. Double and Triple Hangers allow placement of additional fixtures on grids or stands, when coupled with optional adapters. Telescopic Hangers perform the same function as Adjustable Hangers, but add the ability to easily fine-tune a fixture's position at the fixture itself.